How Long Should a Kitten Stay With Its Mother? When Do Kittens Lose Baby Teeth? When Can Kittens Leave Their Mother? When looking to adopt a kitten, it's common to see very young cats for sale or for adoption. But while it may be commonplace, placing a kitten in a new home at too young of an age can be detrimental to the cat. Mother cats will typically start to wean their kittens off their milk at one month of age. This does not mean that this is the time that the kittens can go home, though. The next month of life is still full of essentials for a growing kitten, even if it isn't consuming its mother's milk all of the time. The weaning process usually continues for about another month until the kittens are fully weaned between eight and 10 weeks of age. During this time, the kittens will still occasionally nurse on their mother but they will also start to eat liquid kitten food. The liquid kitten food should gradually get thicker until it is a watered down canned kitten food or a moistened kitten kibble. Over the four to six week weaning period, the kitten will consume less and less milk from its mother. Getting a kitten used to eating dry food can take some time, so it should not be forced or rushed. What If the Mother Cat Is Not Around? If the mother cat perhaps did not survive the birth, was not healthy enough to care for kittens, got hit by a car, or if a litter of kittens was abandoned at a shelter, the kittens can still get the necessary nutrition they need and lead a healthy life with the help of humans. Some shelters will use a foster lactating cat to both nurse the kittens and socialize them or bottle feed the kittens with kitten milk replacement formula. Bottle fed kittens do not receive the same care from humans as they would from a cat though. Cats teach their young important skills that we cannot duplicate as humans. Bottle fed kittens are a huge time commitment, so if you are adopting a young bottle fed kitten who has no mother cat, be prepared to feed and clean them often. What Happens When a Kitten Is Removed From Its Mother Too Soon? If a kitten is taken from its mother and sent to a new home too soon, there can be some serious health consequences. The first few weeks of a kitten's life are essential for its health and body development. The colostrum and nutrients in the mother's milk are responsible for strong bone development, eye health, and full organ development, so if a kitten is weaned too soon, you could be increasing the risk of your cat developing more health issues later on. A kitten removed from its mother too soon may need nutritional supplementation and other veterinary care early on in life. In addition to health concerns, behavioral issues can arise in kittens who were removed from their mothers too early in life. 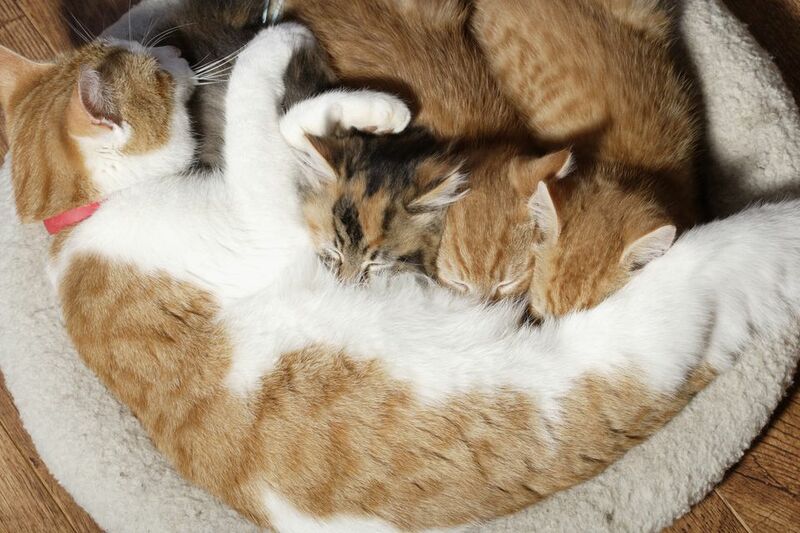 Mother cats teach their kittens' lifelong lessons and give off calming pheromones. Kittens who left their mothers too soon may have trouble grooming themselves, not know how to bury their waste in the litter box, play too rough, not know how to hunt for food, or have other behavioral problems. A kitten that is removed from its mother too soon may also have trouble adjusting to its new home and you. Growing up with a mother and littermates is an essential part of cat socialization. Without proper socialization at a young age, the kitten may grow up to be fearful, skittish, or even aggressive. It also may not know how to properly communicate with other cats. You will need to spend significant amounts of time working with a kitten that did not spend adequate time with its mother and litter mates. This will help it adapt to its new home and learn appropriate behaviors. Ideally, kittens should go to their new home around 12 weeks of age. While some kittens can go home earlier, the closer you wait until 12 or 13 weeks, the better off the kitten will be. Your cat's chances of being healthy, well-socialized, and properly developed are dramatically increased by allowing it to spend extra time with its mother and litter mates. How Does a Kitten Change From 6 Months to 1 Year of Age? How Much Food Does Your Kitten Need? What Vaccines Does My Kitten Need and When? Why Is My Kitten Sneezing So Much? Is It Safe for Your Kitten to Play With That? How Do You Safely Give a Kitten a Bath?